We've now gotten more details on the 2015 Lincoln MKC compact crossover, which is scheduled to debut at the Los Angeles Auto Show next week. 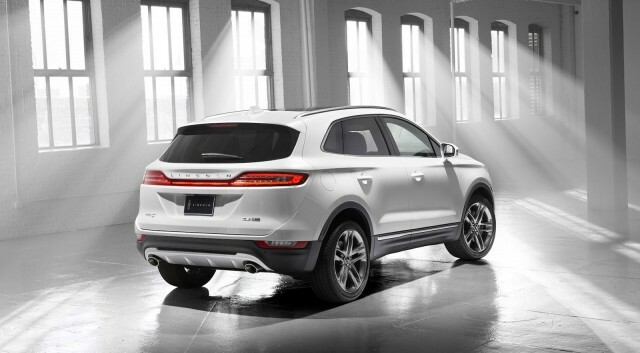 The new MKC model is based on the Ford Escape's platform, but Lincoln has given it several distinctive features, including a new EcoBoost four-cylinder engine that will be exclusive to the brand, at least for the time being. That engine--the sixth in Ford's EcoBoost lineup--is a 2.3-liter four-cylinder. It produces 275 horsepower and 300 pound-feet of torque. Base models will be equipped with a carryover 2.0-liter EcoBoost four-cylinder, with 240 hp and 270 lb-ft. The MKC will be offered with either front-wheel drive or all-wheel drive. Lincoln did not specify which transmission would be offered. It will likely be a six-speed automatic similar to the one offered in the Escape, but with the push-button gear selector first seen on the MKZ sedan. In addition to the EcoBoost engines' direct injection and turbocharging, the MKC will also feature active grille shutters for improved fuel economy. EPA-rated fuel economy figures will be released closer to the car's launch next year. The EcoBoost powertrain is wrapped in styling that is almost identical to the MKC concept unveiled at the 2013 Detroit Auto Show. Standout features include Lincoln's wing-shaped grille at the front and a wraparound lift gate at the back. A panoramic glass roof will be optional. The overall packages should look pretty good under the lights at the Los Angeles Auto Show. The interior features plenty of leather and wood, as well as an all-new steering wheel design that will be used on future models, Lincoln says. On the technology front, the MKC will get Ford's Sync voice-control and MyLincoln Touch infotainment system, controlled through an eight-inch touchscreen. Owners will also be able to use the MyLincoln Mobile app to start, unlock, lock, and locate the vehicle, as well as set the interior temperature. An approach-detection feature illuminates "welcome mats" in the shape of the Lincoln logo next to both front doors, and illuminates exterior lights. Safety features include collision warning with brake assist, lane keep assist, cross traffic alert, a rearview camera, and seven standard airbags. A version of Ford's park assist system will also be available. 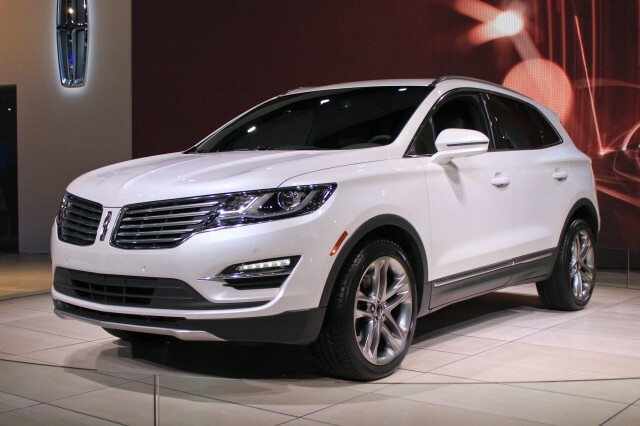 The 2015 Lincoln MKC will debut at the Los Angeles Auto Show next week. It will go into production in the second quarter of 2014 at Ford's Louisville, Kentucky, plant. The first cars will arrive in showrooms next summer.